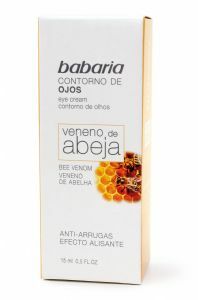 Bee Venom which is the latest anti-ageing active for younger looking skin. This Bee Venom eye cream will target your eye area to brighten and reduce the look of tiredness. It helps to Control the facial muscles, increases blood circulation, therefore gently plumping out wrinkles making skin appear more firm. Makes fine lines and wrinkles appear smoother. The product was developed from 100% natural Bee Venom. The collection is done in the traditional manner by professional beekeepers. Aqua, Octyldodecanol, Pentylene Glycol, Propylene Glycol, Oleyl Erucate, Glycerin, Alcohol Denat, Bee Venom, Spilanthes Acmella Flower Extract, Sodium Polyacrylate, Tocopheryl Acetate, Parfum, Tetrasodium EDTA, Acrylates/Vinyl Isodecanoate Crosspolymer, Alpha-Isomethyl Ionone.